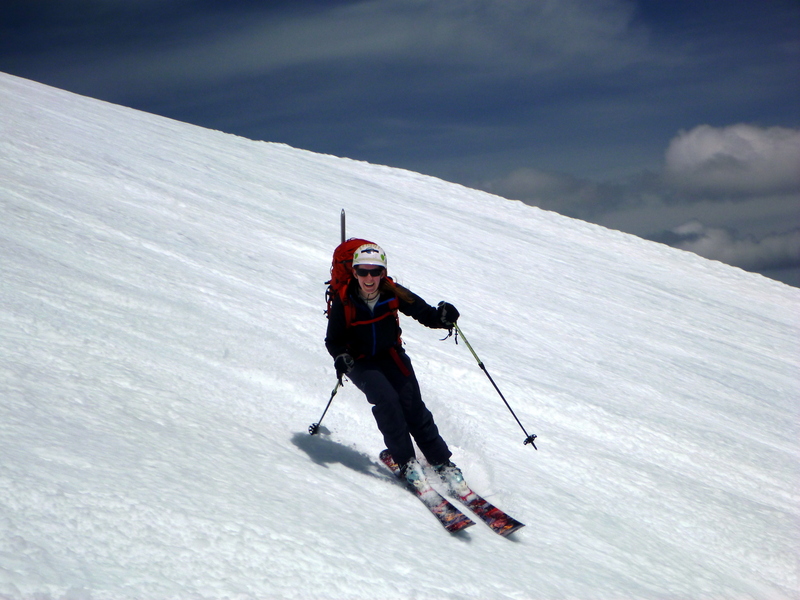 Becca (a classmate from the Mountaineers ski/snowboard mountaineering class) and I headed up Mt. 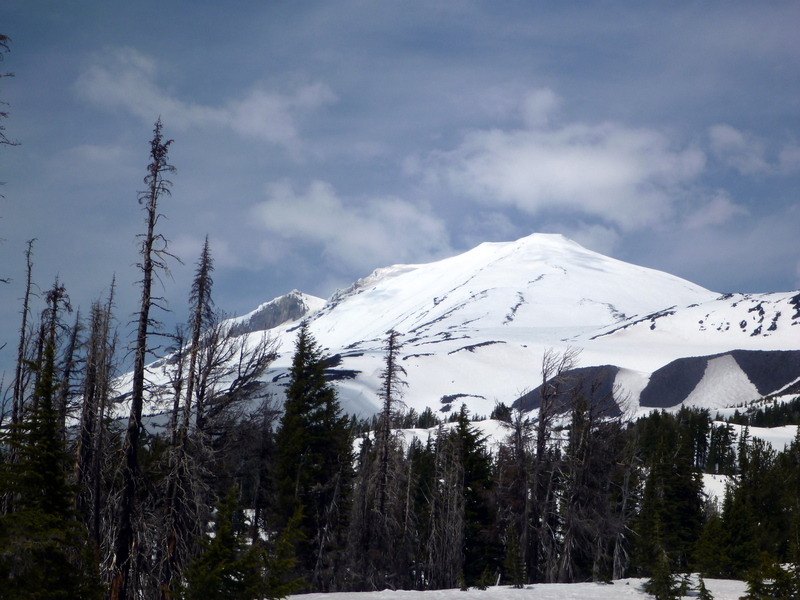 Adams from the parking lot at Cold Springs to take advantage of the beautiful weather window and no permit fees yet. 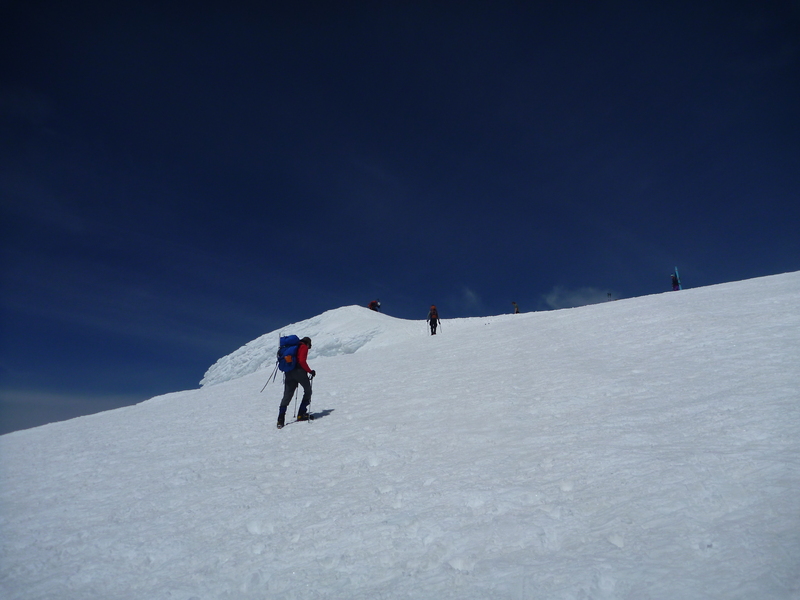 This would be my second climb of Adam’s – after a trip on foot in 2012, I was really savoring the idea of a ski descent. We arrived from Seattle after a 5 hour drive through Portland at about 9:30pm and crashed for a very short time. We headed out at around 3am thinking the snow would get soft and sloppy early in the morning given the warm night. The first ~mile and few hundred feeet were on dirt but we hit continuous snow at 6000′, transitioned to skis, and found that the snow froze harder under the clear skies than we were expecting; a breakable glaze covered everything and made skinning a bit challenging, especially on the steeper sections. As we skinned up Suksdorf Ridge we got pulled a little bit too high below South Butte in the dark and had to backtrack a bit to regain the line. 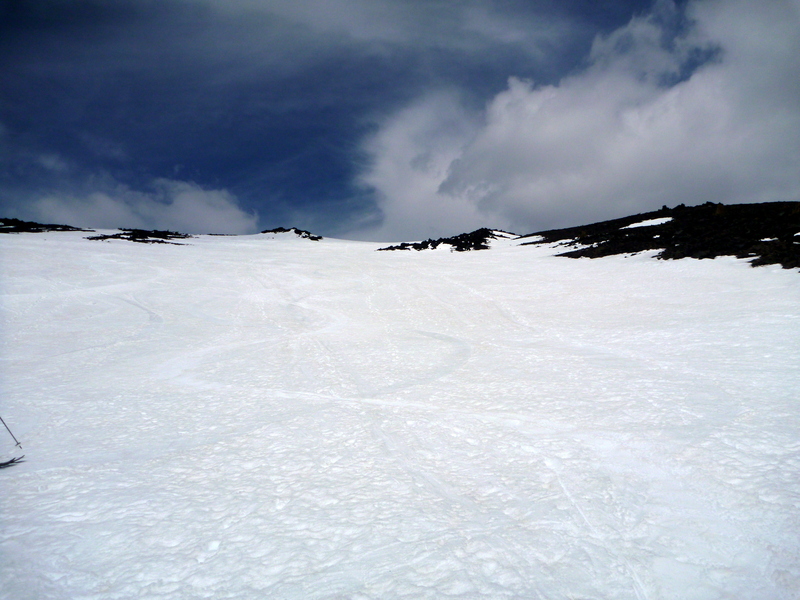 The 2500′ below a false summit known as Piker’s Peak is a long snow slope of 25 or 30 degrees pitch. 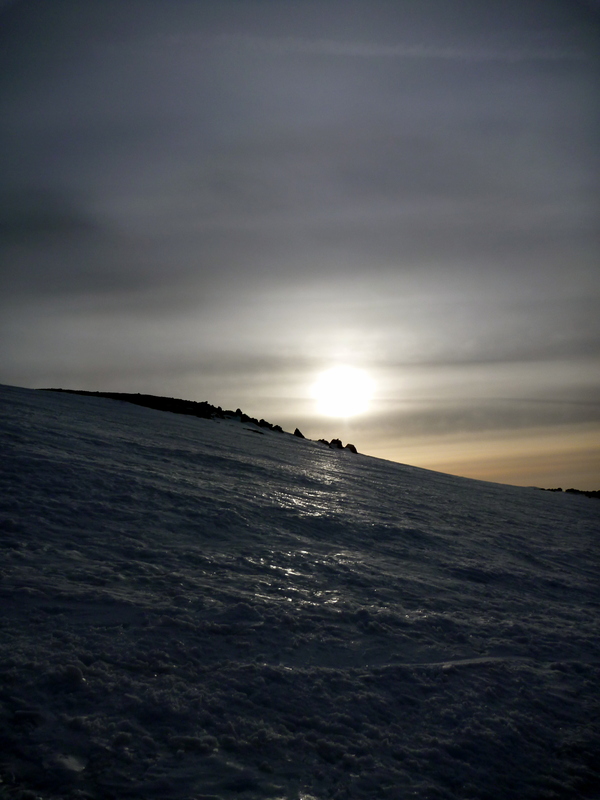 I wish we had our boot crampons for the very firm conditions on the climb up to Piker’s – it was a bit tenuous trying to kick steps. Probably 80% of skiers were booting up rather than skinning. The snow began to barely soften as we arrived at the top of Piker’s at around 11am. It was sunny and warm here – virtually no wind. 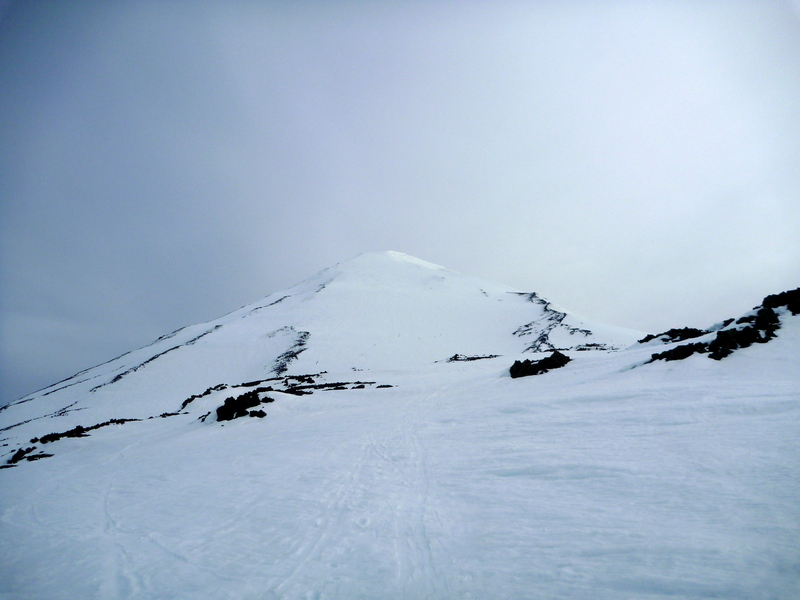 Many napped waiting for the South Face to soften from frozen into creamy “corn” snow, while others skinned up to tag the summit – we probably saw around 30 skiers and numerous climbers. I decided to go for it. 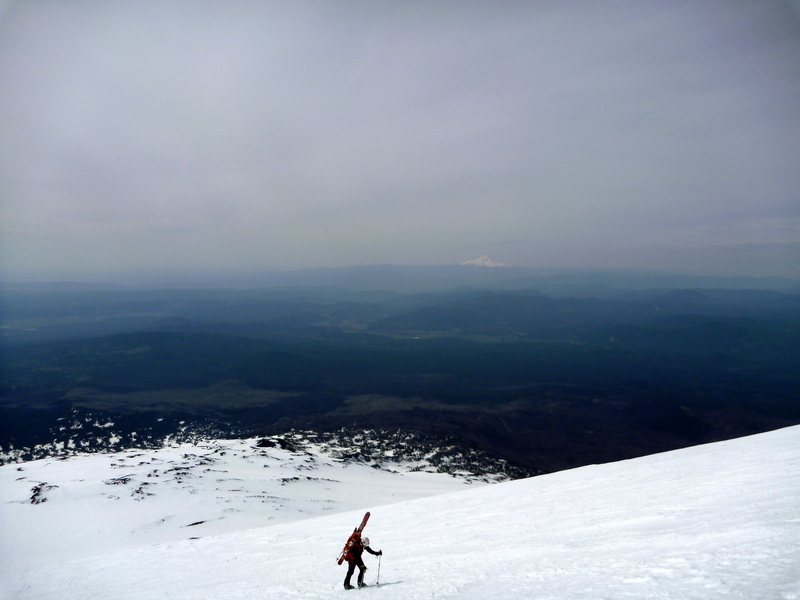 As a terrible son who chooses to ski a volcano instead of calling his mom on Mother’s day (no reception on top! 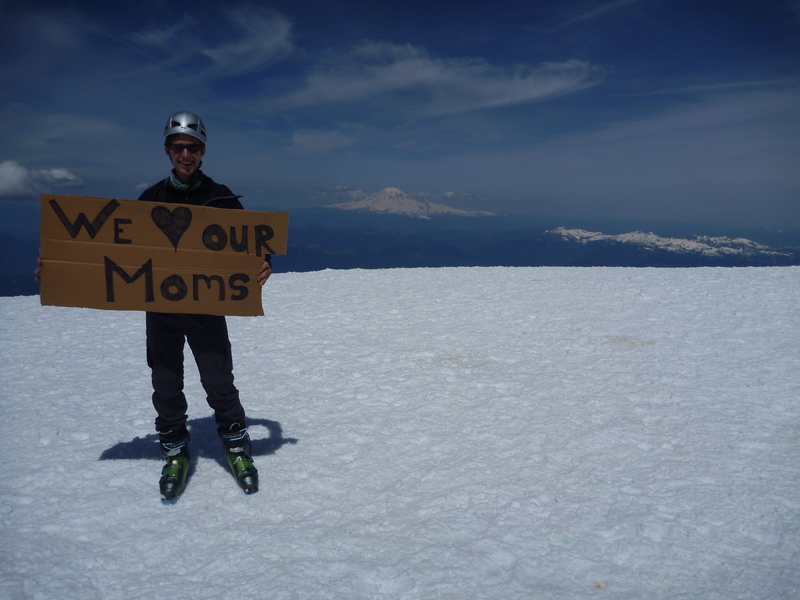 ), I appreciate the person who hauled the fun sign (“We ❤ our moms”) to the summit and let me use it for a photo op. 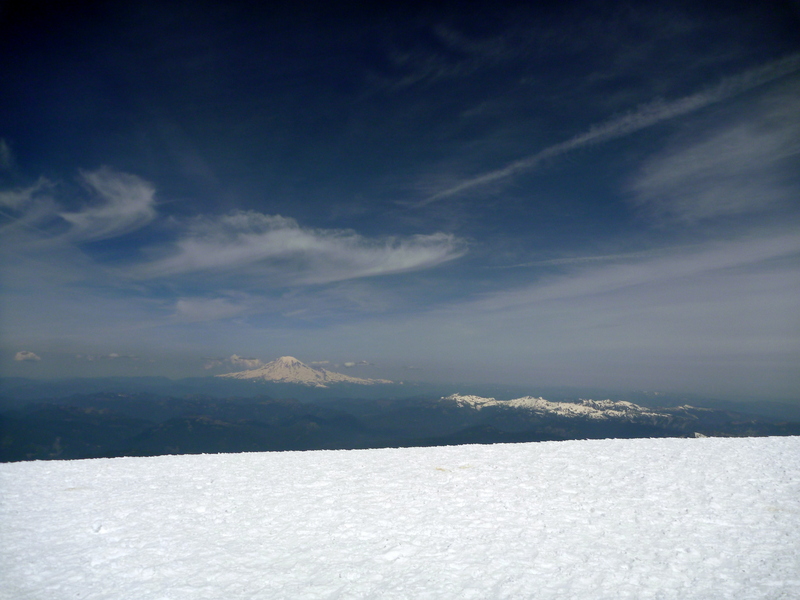 The snow below the true summit skied pretty well. It was nice corn but not as smooth as what awaited below. After surveying the globs of water ice hanging around the top of the SW chutes we elected to enjoy the South face instead (didn’t see anyone drop the chutes but I could easily have missed it). We rested until a bit after 1pm and headed straight down. Life altering. 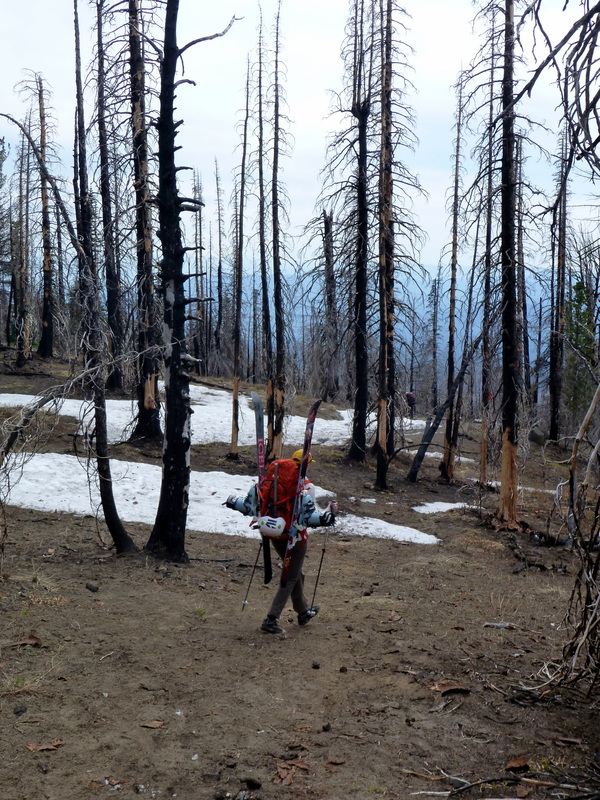 As a first-season backcountry skier I had no idea spring corn would be this much fun. 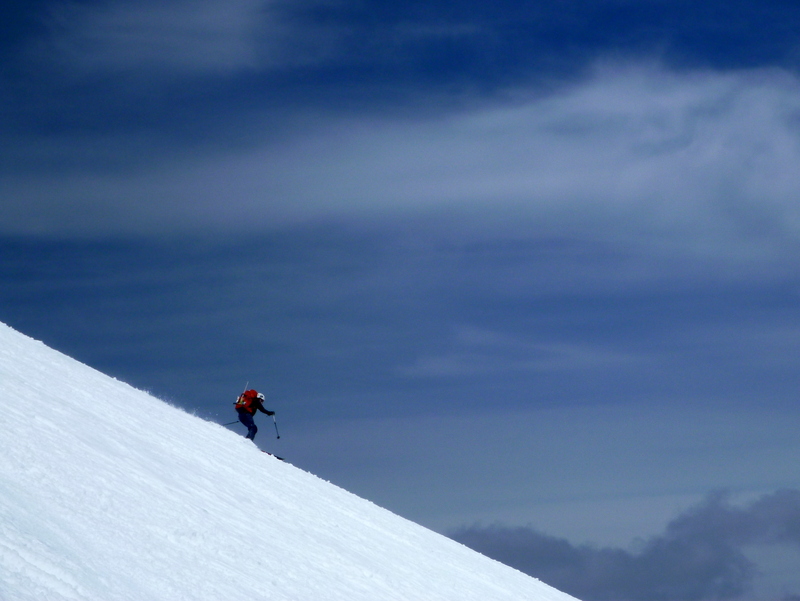 The descent from Pikers was absolutely perfect: great pitch, smooth snow texture, and blue skies. 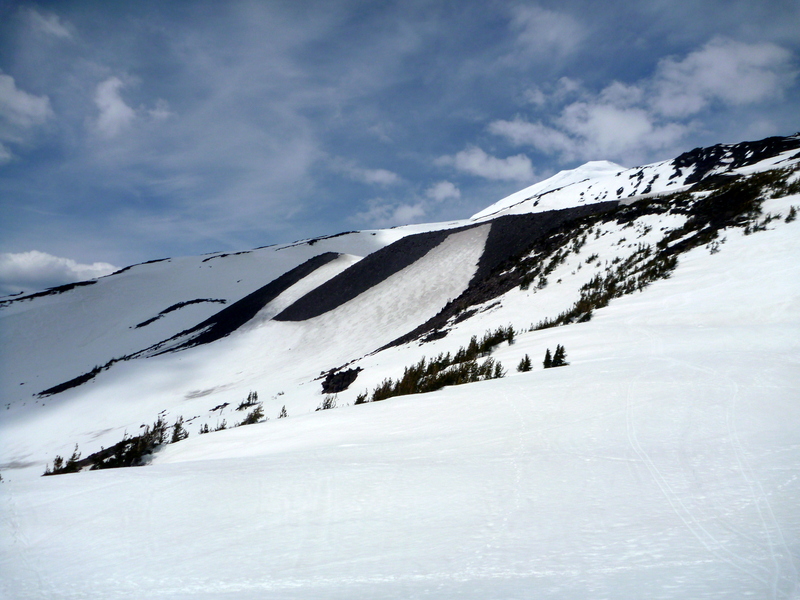 These few thousand feet were pure skiing bliss. I can’t remember a better day at a resort. But the dark side of skiing the backcountry is how soon the descent ends – after just a few minutes we were back down at the foot of the slope ready to begin the descent the rest of the way to the car on rolling, mild slopes. The Suksdorf Ridge approach actually skied pretty well on the way down even this late in the day and didn’t get sloppy until well below treeline. While the drive and ascent are a real slog for a day trip, skiing more continuous vert than any resort in North America is hard to beat.